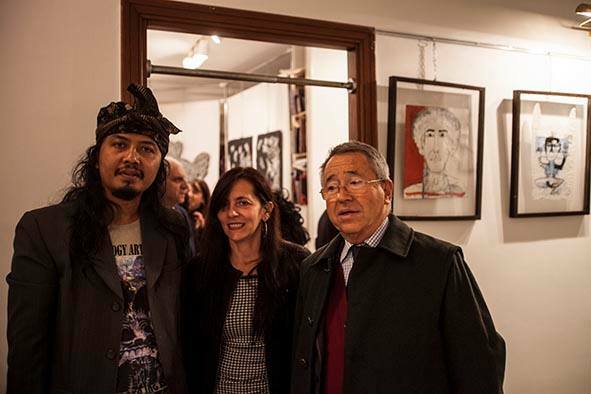 Contemporary Indonesian art and literature have found a new home in the Italian city of Naples. ASEF culture360 contributor Naima Morelli interviews Professor Antonia Soriente from Università degli Studi di Napoli and gallerist Vincenzo Montella who have contributed to promote the dialogue between the city and Indonesia. The ties are strengthened by the presence of institutions such as the Indonesian Honorary Consulate in Naples and the prestigious language university L'Orientale, which has an important course in Indonesian language and literature run by Professor Antonia Soriente, a key figure for the promotion of Indonesian culture in Italy. Also, several Neapolitan institutions cooperate with independent cultural operators. Gallerist Vincenzo Montella, co-founder with Setyo Mardiantoro of the arts and culture center ll Ramo D’Oro, has been creating art exchanges between Italy and Indonesia for many years. He recently hosted “Attualità Indonesiane”, an exhibition of three Indonesian contemporary artists working with social issues and community art. Have you seen the Neapolitan cultural landscape change in the past few years, in terms of sensitivity towards Indonesian contemporary art and literature? Naples has a long tradition of Indonesian studies thanks to the Università degli Studi di Napoli “L'Orientale”, which introduced the course around 50 years ago. While previously limited to isolated events, in the last few years the situation has improved. There have been new possibilities of exchange between universities. Times have changed and with our individual efforts we have been able to make the difference. Personally, I’m always open to conversation and happy to connect even beyond my specific field, which is Indonesian language and literature. I believe that culture is forged not just at the university level, but also beyond. In the past few years you have developed a series of seminars on Indonesian culture at L'Orientale, inviting Indonesian cultural operators to give talks and engage with students and the general public. What are the themes and issues discussed in the seminars? The seminars on Indonesian culture are transversal, spanning from classical literature to contemporary cinema. I often have Indonesian cultural professionals visiting me and I never miss the chance to invite them to share experiences from their own field. I try to use my personal relationships to give the city, the university and my students the opportunity to meet intellectuals and experts that they wouldn’t have otherwise met. You also work as a translator of Indonesian literature. Can you tell us about the most interesting books you have translated, in terms of depicting a contemporary image of Indonesian society? For a variety of reasons, there are only a few books of Indonesian literature translated into Italian. Among those translated by my students and l, a pivotal work is definitely Saman by Ayu Utami, a watershed between old and new literature in Indonesia. Most recently I have translated Leila Chudori’s Pulang, a historical novel revolving around the failed coup in Indonesia, as seen by a group of Indonesian exiles in Paris. This year we have presented Oka Rusmini’s Tarian Bumi, an unconventional novel set in traditional Bali and touching issues of gender and class. On our Italian book tour, the public was surprised to discover a different Bali beyond the cliché of untouched beauty and harmony. What needs to be done in Naples - and Italy generally - to support Indonesian art and literature? At the university level, we need more adjunct professors. The Indonesian government should send us experts with different backgrounds than my own, so that as to offer a broader variety of profiles for the students.. On top of that, we need to strengthen our network herein Naples. Indonesia is a key player in the ASEAN economic community and the biggest one in terms of population - we should be more attentive towards this country. As a relational psychotherapist, I first arrived in Bali following the footsteps of Gregory Bateson, founder of this method. I was interested in the role that Bateson attributed to art in Balinese society. I furthered my interest learning about contemporary Indonesian social and political issues. Together with Indonesian artist Setyo Mardiyantoro, I decided to found Il Ramo D’Oro. What are the perks and challenges of exhibiting Indonesian contemporary art in Naples? Even though we have organized events all around Italy, Naples is still our home base. Here we also have the chance to follow the entire preparation of the exhibition personally, entering into conversation with the visitors and promoting cultural exchange, which is our main mission. Is the Neapolitan public particularly sensitive to community art and social art? An inclusive attitude has always been present in Naples. In recent times we have seen it in the art installations in Piazza Plebiscito and in the metro stations designed and decorated by contemporary artists. Along with graffiti and murals in the working class neighbourhoods, there is also a sense of art as a daily experience: a kind of “widespread art”. At Il Ramo D’Oro, you don’t simply showcase work, but you are also keen to provoke discussion around the art, inviting the artists, curators and institutional stakeholders to engage in conversations with the public. 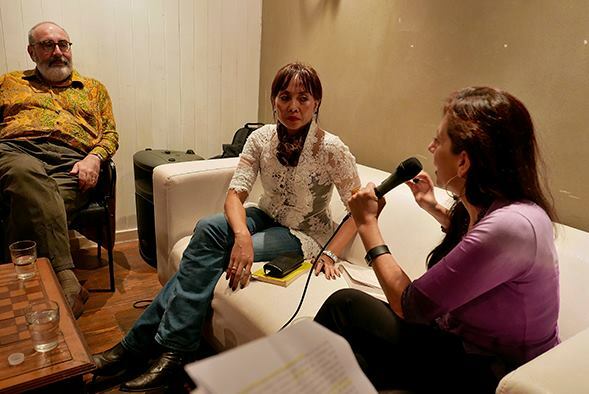 How is the discussion articulated in relation to your latest show “Attualità Indonesiane”? It has been more than three years since we have taken this route. We have realized we are not a commercial gallery and as a cultural association we must be continually connecting with our local community. The presence of the artist Made Bayak at the opening of “Attualità Indonesiane” was very important. 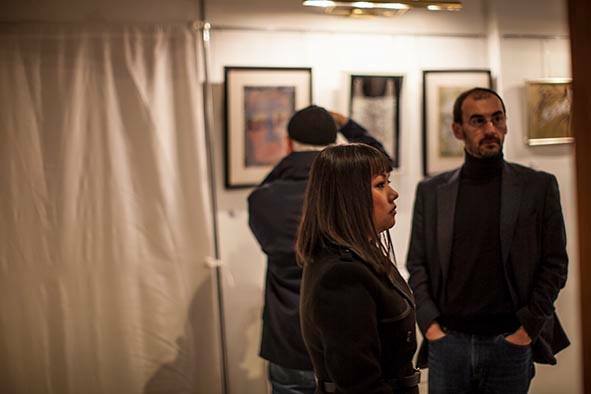 Many of the visitors were already familiar with Indonesia and engaged in lively conversation with the artist. They were also surprised to read strong statements in the artist’s work about tourism and pollution in Bali. For his part, Made, whose art is created with garbage and plastic, was amazed to visit the Plart museum of plastic here in Naples. It all starts from an understanding of the similarities and differences behind every artistic expression. In general, we Europeans tend to be more aggressive towards history and nature. I’m thinking of the different reactions of the French and Indonesian presidents after the terrorist attacks in Paris and Jakarta. Also, on the Indonesian side, I would urge them to understand in a critical way their differences from the West. Only by understanding the differences are we able to maintain our own identity. Literature helps in this sense, and that’s why at Il Ramo D’Oro we try to collaborate to create ties between all artistic expressions.